A large industrial/base styled map. The author sticks to his mold and creates a large, linear, even flowing level. There are a few places where one may get turned around a bit after climbing about in air ducts, but you'll never wander too far off the beaten path. If you pay attention to the doors and corridors as you pass by them the view screens will point you in the right direction, so getting lost isn't a major an issue. As per par on his previous maps, the author provides you with just enough health to get by and maybe a few extra rounds in your clip to make sure that trooper isn't getting up. The flow of the map is as even as the reflection on a mountain lake during a calm autumn morning. Almost tedious due to the redundancy because of the limited weapon selection and limited variety of aliens. There are several different aliens to be encountered, but the amount of troopers Duke has to burn through before encountering an enforcer almost makes you want to run up and hug it before you put a bullet through it's brain. 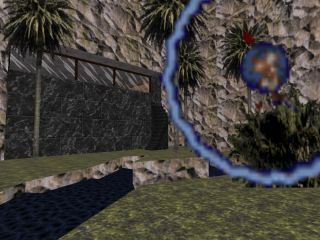 The level is so even throughout, if it wasn't for the outdoor scenery at the end, you might not have even known you'd reached the finish. 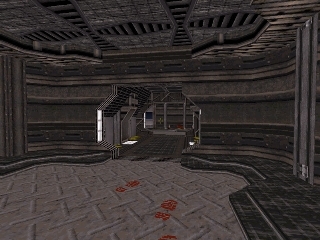 The map is made up soley of corridors and rooms with a few air ducts tossed in. 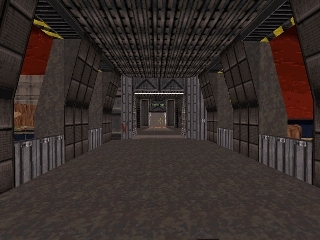 Amazingly, the effective use of lighting and different textures for each area are quite successful in breaking up what could have been a very monotonous map. 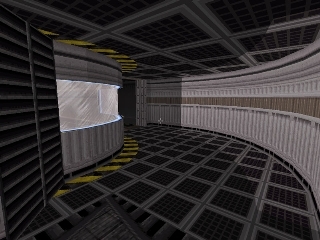 The air ducts can get on one's nerves, but they're limited to mainly one section of the map. Don't expect any major architectural wonders, but the level is fairly well detailed throughout, each area has its own specific design, and there are a few pieces of eye candy added in. Overall the design is straight forward, and the change-up in the look of each area, with a few tossed in places that peer outside at the surrounding landscape, keeps the map from getting dull and gives it a "Logan's Run" feel. The limited puzzles and consistency of the combat makes game play a walk in the park (If you walk through the park shooting everyone's dog). after a two and a half year break. 18, in college. just after the reactor core. Please note that this map *requires* EDUKE32 or another limit-breaking port. This map exceeds the traditional 1024 sector limit. fees (The cost of a CD-R, bandwidth, packaging, or distribution media). and I am certainly not getting paid for it or for distributing it. the original author (Cody "Supertanker" Jackson) for designing the base map. Page generated in 1.4889 seconds.